Q 1: What can be done when using a SQL object when not using a stored procedure? B. Select rows from a database. C. Delete rows in a database. D. Insert rows into database. Q 2: How can an Uploaded file be combined with data from a database? A. Include the Uploaded file and a package as a Data source to the report. B. Nest a List using the Uploaded file with another List from a package. C. Use a Master detail relationship. D. Create a Data module. Q 3: A report author creates the following filter in a report: [Region] in (' Americas',' Asia Pacific') Which type of filter was created? Q 4: A report author wants to display the report name on the report page. Which type of calculation should be used? Q 5: A report author has to create a Crosstab report with Region and Product data in the rows of the Crosstab. The Crosstab can be created in two different ways as shown below. Which Crosstab/Crosstabs is/are discontinuous Crosstab/Crosstabs? 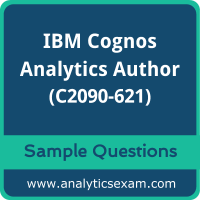 Note: Please write us on feedback@analyticsexam.com if you find any data entry error in these IBM Cognos Analytics Author V11 (C2090-621) sample questions. There are currently 59 users and 369 guests online.